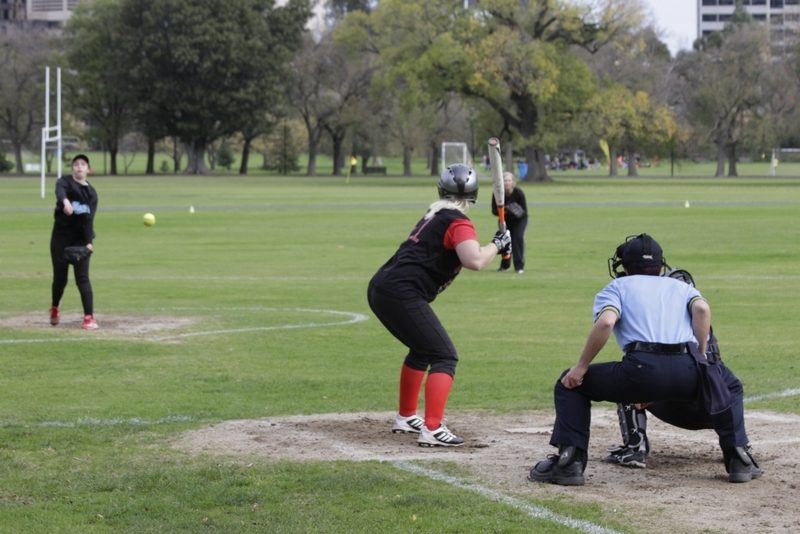 Melbourne Metro Senior League’s fastpitch softball competition at Fawkner Park South Yarra commences on the first Sunday of May annually. Games are played each Sunday through until the end of August except for the Queens Birthday weekend in June. The competition finishes with three weeks of finals finishing with the Grand Final for each division to be held on the second Sunday in September. A detailed fixture will be available early in the season. Training:- Teams usually have a training session each Sunday and this session commences between sixty and ninety minutes before the scheduled game time. Actual times are determined by each team coach. Mid week training is rarely held due to the lack of facilities with lighting. As always it takes more than the players to put a team on the diamond for a game/season. The call goes out for Scorers and Managers for each team. Maybe you know someone who might like to come to the park and help out? Or someone who is interested in giving coaching a go? With support and assistance of course. Also necessary for a game are umpires. Training and support is provided for novices or experienced umpires. Interested? If you would like to lend a hand, please see any of the Executive members who will steer you in the right direction. Fees are levied by Melbourne Softball and shall be paid by everyone participating in any League/competition. This fee includes a levy to cover registered members for both public liability and personal accident insurance premiums. Clubs/teams may also add an extra amount to cover their costs of putting teams on the diamond. Clubs/teams are responsible to collect all fees/levies for all members participating in their teams and to pass applicable fees on to Melbourne Softball. All fees must be paid by the third round of each competition. Most clubs understand that a lump sum payment may be difficult for some, so an arrangement to pay by regular installments can be made with the club management. All players are required to be in full uniform as soon as possible, but by no later than the third week. Clubs/teams are responsible to register with Melbourne Softball details (style/colour) of the uniform to be worn and to arrange provision to their members. The Clubs provide all the necessary equipment for players including bats, gloves, balls and safety wear such as batting helmets and catchers’ protective gear. As they gain experience, players may choose to purchase their own equipment, particularly gloves. Coaches or committee members are always on hand to give advice on purchasing equipment. It is advisable for players to wear appropriate footwear such as softball/baseball cleats or boots with moulded soles as the grounds may become soft and slippery. Please note that boots with metal cleats or screw-in stops are not permitted in any circumstance under the rules of Melbourne Softball. The clubrooms are there for use of members and supporters. Everyone is invited to congregate and relax in the social room. And there are toilets, change rooms, showers and don’t forget the canteen where there is yummy ‘stuff’ for lunch. The Home Plate Bar is also open on a Sunday afternoon. Melbourne Softball is committed to providing a safe environment in which to play our game. Diamonds are inspected regularly to determine their suitability for play, however, as this is a winter competition it is to be expected that playing surfaces may become wet and muddy – so come prepared. In the event of severely inclement weather, Melbourne Softball will determine, on the day, if games shall be played. However, if a lightning storm should move in, all play will be suspended or cancelled. If lightning does occur, do not shelter under or near trees – it is safer to be out in the open. If games are cancelled due to inclement weather you should make contact with your Club secretary or coach as Melbourne Softball advise them of the situation regarding play or abandonment of games. Injured Whilst Training or Playing in the Park? If you are injured you should arrange to complete an official record of the injury. You are encouraged to report any injury as ‘it’s nothing’ may develop into ‘something’ that entails an insurance claim. A downloadable injury reporting form is available. Customarily, if a player is in need of emergency treatment, we arrange an ambulance or transport them to the nearest medical facility, which is the Alfred Hospital on Commercial Road. Don’t panic! Injuries requiring medical treatment are not common place, but players need to know strategies are in place if such an emergency should occur. If you wish to bring your beloved canine to softball, please be aware that the park has designated areas where your dogs must be kept on leads. There is also a requirement to clean up after your dogs too, so perhaps come prepared with poo disposal equipment. The Ranger patrols regularly and we would hate to see any fines imposed on our softballers. Members are encouraged to check out the Melbourne Softball home page www.melbournesoftball.org.au for updates on the competition and other softball happenings. Please don’t hesitate to contact any committee member for assistance on any matter.